Oh, the fun of the old classic instruments of the 50’s! Today’s post is from the group of coworkers that love the retro look and feel. They talk about Mad Men over Monday morning coffee, they dress with classic colorful box designs, they have interesting lamps and while they couches look cool and are great for sleeping on, you tend to slide down a bit when trying to sit on them. They don’t think of themselves as ‘vintage’, it is more about being ‘retro’. So, when when AGLogic rolled out their Peepometer iPad Weather app, all anyone wanted to do was check the weather. 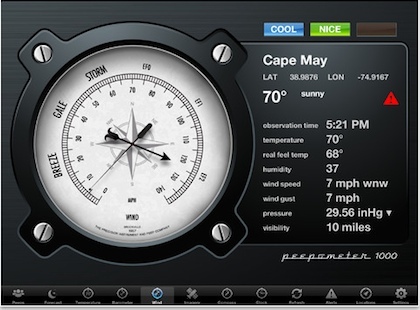 The information provided by the multi screen tools are found in the higher end Weather apps for the iPad. 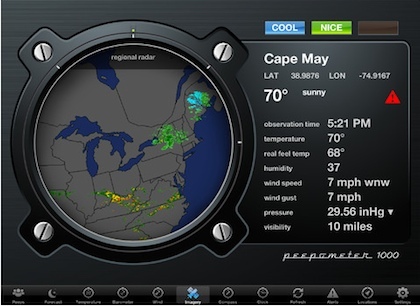 It just happens that Peepometer wraps the information in a series of gauges that are more fun than cold line graphs and simple little puffy cloud icons. 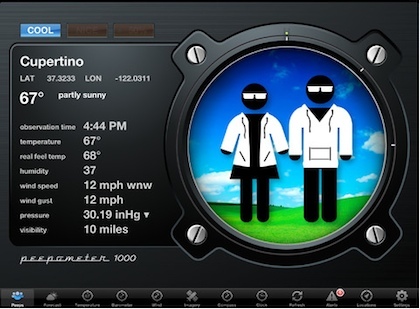 Don’t jump to the conclusion that the Peepometer ‘1000’ only gives you the information that your dad’s wall dial gave. The app still provides all the needed weather related data you may need, just wrapped in a look that makes it fun to have open on the desk when the iPad is idle. Yes, even weather radar, while not available in color in the 50’s can be enjoyed now with a bit of retro class through Peepometer.